Here we go! 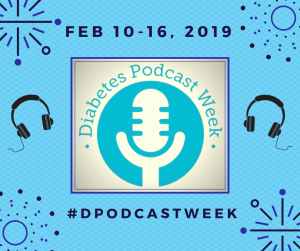 Diabetes Podcast Week is here! If you already enjoy listening to one show about diabetes, I hope you’ll give another one a try. If you’ve never heard a podcast, this is a great chance to jump in. All this week (February 10-16th 2019) the shows listed below are joining together to tell our listeners about the Spare a Rose campaign, to benefit Life for a Child. We’ll also have some fun with cross promotion. The list below will take you to the episodes specifically published during #DPodcastWeek (the links will be updated as the episodes are released). Different shows are hosted on different platforms so the players here may look different from one another, but they should all play right here in this post. Any show without a player has a clickable link to the #DPodcastWeek episode. To visit the homepages of the shows and and find other episodes, click here or search on your favorite podcast player. Listen to “Episode 4: Going Home” on Spreaker. Diabetes Podcast Week is coming! For the 4th year, podcasters in the diabetes community will come together to help you find great shows and learn about a terrific charity. 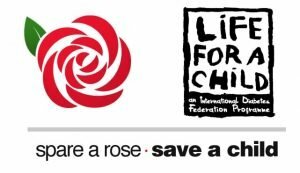 For the week of February 10th, 2019 shows that take part will tell our listeners about the Spare a Rose campaign, to benefit Life for a Child. We’ll also have some fun with cross promotion and spreading the good word about podcasts. Please reach out to get added to the list below! There are new diabetes podcasts popping up all the time so I’m sure we’ve missed a few. And while these are all T1D shows, any type of diabetes podcast is welcome. Some round-up thoughts this #NDAM..
For the past several years, I’ve used the month of November to showcase people in my local area living with type 1. You can head over to my public Facebook page or Instagram to see the pictures and read their stories. If you found this post and you live in the Charlotte, NC area, please consider joining our parent group or one for adults living with type 1. Thanks to the Charlotte Observer for publishing a column I wrote, “What the Diabetes Community Wants You to Know.” I asked my podcast listeners for their ideas and I was thrilled with what they came up with. I heard from several people outside the diabetes community who thanked me for opening their eyes to what living with diabetes is really all about. On World Diabetes Day (Nov 14th) I was asked to stop by my local NBC affiliate to do some basic info stuff. Always fun to go back on the news (I spent 10+ years in local TV and another 10+ in radio). There are too many terrific blogs, Facebook posts and other stories to list here. But please consider following the hashtags #NDAM #DAM #DiabetesAwarenessMonth #MakeDiabetesVisible and #T1DLooksLikeMe to connect with great people. And we can do that all year long! I’ve been there. I know the worry. My son was diagnosed at 2 and is now in eighth grade. We’ve had our ups and downs, in school and out with T1D. In our local Facebook group, the big questions are about CGM and remote monitoring. At least two large area districts seem to have changed their policies about staff following students’ CGM systems at school. These are schools that last year allowed staff to follow using dedicated devices left at school. We’ve already seen many schools ban staff from using personal devices for that purpose. Here’s my take as a mom of a kid who didn’t have a CGM until age 9 and no remote monitoring until he was in 5th grade. I honestly don’t know how these nurses follow all the kids at big schools and do everything else their jobs require. We have more than 1000 kids at some local elementary schools! I am 100% in support of parents and their medical care team creating a school plan that works for them, but I worry that parents think if someone isn’t watching their child’s receiver all day long that the child is going to be ignored. Remember, until about three years ago, there wasn’t a kindergartner in the country with remote share options. The schools, doctors and legislators are playing catch up as the technology moves faster than the policy and legalities. Not saying you shouldn’t push; I love our Dexcom, but it should be a useful tool, not a burden. I do think these schools need to get their policies straight, consistent and well-publicized. The first week of school is not time to be springing new stuff on stressed out parents. That’s just not fair. What can you do? Treat your school staff like part of your care team. Use that kind of language: “our team,” “working together for the same goal,” “how can I help?” Save the torches and pitchforks for when you really need them – and unfortunately, some parents really do need to fight; I know not every school staff is supportive and helpful. Know your state laws (click here for a state-by-state guide) and don’t be afraid to call an advocate or even a lawyer. But that should be the last resort, not the first option. I hope this week’s show helps you learn more about your rights, federal law and school policy. I also hope it helps to hear Crystal and I talk about sending our kiddos to school with “older” tech. Her daughter was diagnosed at one and is now a healthy, happy 27 year old ICU nurse. Benny tells me he’s a “senior in middle school” and he’s ready to take on the world. Wishing you a great start to the school year!